One of television’s most beloved health gurus has made an unbelievable sacrifice for his fans: A trembling Dr. Oz just allowed his audience to consume him after realizing that his body is the ultimate superfood. Absolutely inspiring. It’s amazing to see a celebrity who’s willing to make the utmost sacrifice for the health of his audience. With trembling hands, Dr. Oz dutifully began to undress while describing how the B vitamins contained in just one bite of his flesh would help people sleep more deeply and potentially even ward off Alzheimer’s in the long term if people ate a piece of him at least once a day over the course of many years. The altruistic nutrition expert then raised his arms and bravely attempted to continue smiling as members of his audience began tearing him to pieces and devouring him. 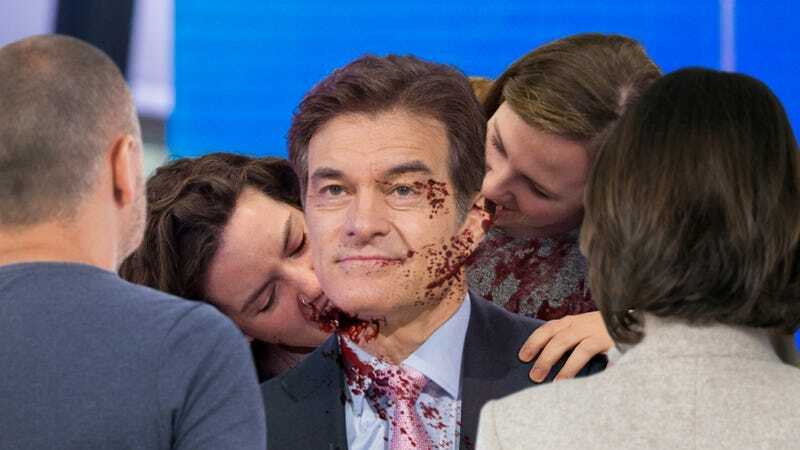 As the members of his studio audience tore him apart with their teeth, Dr. Oz stoically continued explaining how the zinc in his muscles could help fight off mild colds and alleviate sore throats, raising his voice to be heard over the wet smacking sounds of his own body being devoured. “The high iron content in my liver will help improve muscle function,” Dr. Oz declared before settling into a long, continuous moan that lasted until the audience finally ate through his Achilles tendons and toppled him to the ground. Fully engulfed by the ravenous mob, he selflessly shouted one final tip about adding shards of his protein-filled body to your favorite post-workout shake before letting out a sickening gurgle and falling silent. By the time the show returned from commercial break, the audience had left only bones. Dr. Oz, your commitment to the nutrition of your audience was without equal. We will always remember you for selflessly giving your life to the health-conscious fans you loved so well! Ah, Humphrey Bogart—Simply Fantastic. A Class Act!